Air Canada Vacations has dropped the price of a 1 week all inclusive package (flight, hotel, transfers, all meals, all drinks) from Toronto to the Flamingo Vallarta in Puerto Vallarta, Mexico down to $609 CAD per person including taxes. The Flamingo Vallarta has 4 circles on TripAdvisor with 39% of reviews rating it as Excellent. It's generally considered to be a solid 3* hotel. The flights from Toronto to Puerto Vallarta, Mexico are non-stop both ways. A very well priced non-stop flight from Toronto to Puerto Vallarta would generally cost around $450/person just on it's own. 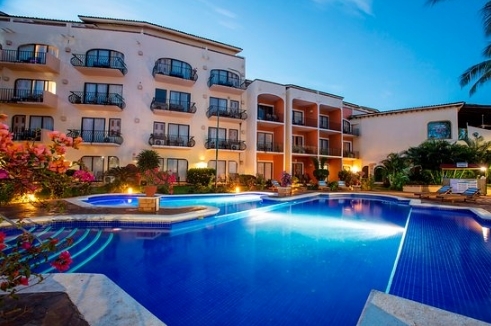 Doing the math, and subtracting the cost of the flights, you are essentially getting a place to stay in Puerto Vallarta that's a little older, not very big or fancy, but in a great location, with all meals and drinks included, for $45/night! NOTE: After your Expedia search completes, use the 'Search by Hotel Name' drop down menu near the top left to find the 'Flamingo Vallarta Hotel And Marina'. toronto, yyz, mexico, puerto vallarta, pvr, air canada vacations, all inclusive packages, north america and flamingo vallarta. 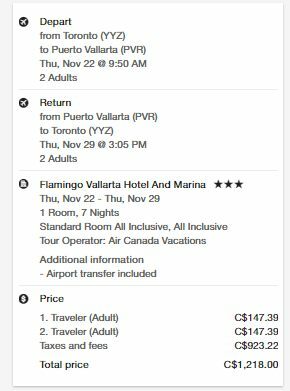 3 Responses to "1 Week All Inclusive Package: Toronto to the Flamingo Vallarta in Puerto Vallarta, Mexico - $609 CAD including taxes"
The $45/night calculation is based on the typical 2 people sharing a room. 2 people would pay a total of $1218 for their 2 flights and 1 hotel room. From $1218, we subtract the cost of 2 well priced flights to Puerto Vallarta ($900). This leaves us with $318 left over. And then $318 divided by 7 nights = $45/night.